1st - AeroMedical Landing Zone assignment, Cape May County airport. 5th - DVD Player smoking, 323 Erma Ln. 6th - Alarm system, 301 E.Raleigh Ave. Bldg.B Diamond View condos. 7th - Mutual Aide Station 61 Electrical fire, 3704 Bayshore Rd. 9th - Carbon Monoxide Alarm, 545 Seashore Rd. 10th - Mutual Aide Station 72, Structure fire Pennsylvania Ave.
19th - Alarm system, 602 Shunpike Rd. 23rd - Alarm system, 821 Seashore Rd. 23rd - AeroMedical Landing Zone assignment, Cape May County airport. 24th - Chimney fire, 245 Chestnut Ln. 27th - M.V.A. with Entrapment, Fishing Creek Rd. 28th - Mutual Aide Station 61, Structure fire 657 Townbank Rd. 5th - AeroMedical Landing Zone assignment, Cape May County airport. 7th - AeroMedical Landing Zone assignment, Cape May County airport. 12th - Mutual Aide Station 11 Avalon, Structure fire 4713 5th Ave.
14th - M.V.A., Breakwater and Seashore Rd's. 15th - Alarm system, 9901 Seapointe Blvd. North Bldg.3rd floor. 17th - Alarm system, 9907 Seapointe Blvd. 20th - M.V.A., Car Vs. Pole. 771 Seashore Rd. 21st - Alarm System, 9905 Seapointe Blvd. South Bldg. 22nd - Report of smoke, Trolley Barn 821 Shunpike Rd. 22nd - Alarm system, 8 Timber Ln. 26th - M.V.A., Breakwater and Hornet Rd's. 28th - Mutual aide Station 60, Structure fire 240 Bay Ave.
2nd - M.V.A. with Entrapment, Fishing Creek and Tabernacle Rd's. 2nd - Carbon Monoxide Alarm, 749 Lilly Pond. 3rd - Alarm system, La Quinta Del Mar 501 E.Raleigh Ave.
5th - M.V.A., 735 Seashore Rd. 5th - M.V.A. with Entrapment, marker 0.9 Southbound Garden state parkway. 8th - Mutual Aide, R.I.C. assignment to Station 72, Structure fire 806 Scott Ave.
8th - Mutual Aide Tanker assignment to Station 72, Structure fire 806 Scott Ave.
8th - Cover assignment, Station 72. 8th - AeroMedical Landing Zone assignment, Cape May County airport. (Station 61 covered the call) 14th - Alarm system, 221 E.Madison Ave.
16th - M.V.A., Breakwater Rd. and Freedom Dr.
17th - Alarm system, 9904 Seapointe Blvd. Garden Bldg. 20th - Alarm system, Naval Air Station Wildwood Museum. 500 Forrestal Rd. 26th - Alarm system, D.R.B.A. Garage. 340 Forrestal Rd. 3rd - Smoke in residence, 822 W.Rio Grande Blvd. 8th - Alarm System, 555 Saratoga Rd. 10th - Alarm System, 9601 Atlantic Ave.
10th - M.V.A. Breakwater & Shunpike Rd's. 11th - Mutual aide Station 60, Structure fire, 115 E.St.John Ave.
22nd - Co Alarm, 501 E.Raleigh Ave.
30th - Lawn Mower on fire, Big sky aviation. 1st - Alarm system, Hotel Iocona 9701 Atlantic Ave.
3rd - Alarm system, 9900 Seapointe Blvd. 5th - Mutual Aide, Station 61, structure fire 409 Delview Rd. 5th - Mutual Aide Station 60, W.Miami Ave at the bay. 7th - Water flow alarm, 994 Ocean Dr.
14th - M.V.A., 557 Seashore Rd. 15th - Alarm system, 221 E.Madison Ave.
17th - Pull station activated, 446 Seashore Rd. 20th - Alarm system, 8 Timber lane. 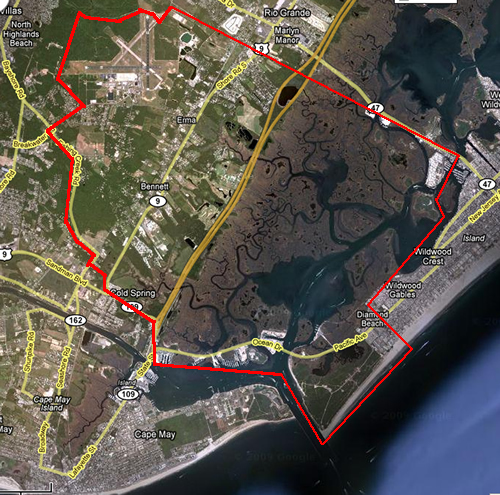 21st - Alarm system, 322 Lakeview Dr.
23rd - Gas leak, 301 E.Rochester Ave.
24th - M.V.A., Seashore & WeeksLanding Rd's. 25th - Alarm system, 9901 Seapointe Blvd. 31st - M.V.A., 641 Breakwater Rd. 3rd - Wires down, 8 Trotter Way. 5th - Mutual aide Station 60,Smoke in cafeteria, Memorial school 2600 Bayshore Rd. 6th - Alarm system, 415 Breakwater Rd. 9th - M.V.A., Rt.9 & 109. 10th - M.V.A., Tabernacle & Seashore Rd's. 10th - M.V.A., Breakwater Rd. at entrance to Airport complex. 11th - Alarm system, 446 Seashore Rd. 13th - Elevator Rescue, 9701 Atlantic Ave.
14th - Alarm system, 405 Breakwater Rd. Lower Townshhip Rescue Squad Bldg. 16th - M.V.A., Rt.9 & 109. 20th - Alarm system, 9900 Seapointe Blvd. 21st - Alarm system, 9900 Seapointe Blvd. 22nd - Structure, 32 Lee Ave.
22nd - Water flow alarm, 994 Ocean Dr.
23rd - Alarm system, 8601 Bayview. 23rd - Alarm system, 1025 Ocean Dr.
23rd - Elevator Rescue, 9902 Seapointe Blvd. 23rd - Elevator Rescue, 9601 Atlantic Ave.
24th - Water flow alarm, 994 Ocean Dr.
26th - M.V.A., 1025 Ocean Dr.
27th - Alarm system, 301 Rochester Ave.
29th - Co Alarm, 9905 Seapointe Blvd. 6th. Smoke alarm, 500 E.Raleigh Ave.
7th. Gas leak, 971 Tecumseh Ave.
8th. Alarm system, 1250 Langley Rd. 11th. Cover assignment Station 72. 11th. M.V.A., Ocean Dr. on the Middle Thorofare Bridge. 12th. Alarm system, 1025 Ocean Dr.
14th. Mutual Aide Sta.61, Structure 4 Deepwater Rd. 16th. Alarm system, 231 S.Station Rd. 18th. Electrical fire, 12 Rabbit Run. 19th. Alarm system, 1025 Ocean Dr.
23rd. M.V.A., Academy & Shunpike Rd's. 25th. Alarm system, 882 Linden St.
25th. Alarm system, 900 Ocean Dr.
30th. Alarm system, 1025 Ocean Dr.
2nd. Elevator rescue, 9th floor 9601 Atlantic Ave.
3rd. M.V.A., Car Vs.Pole Tabernacle & Seashore Rd's. 6th. Mutual aide Sta.61, Structure fire 77 Beachurst Ave.
6th. M.V.A., Rt.109 & G.S.P. 7th. Elevator rescue, 9601 Atlantic Ave.
7th. M.V.A., On the Middle Thorofare bridge. 8th. Mutual Aide Sta.61, M.V.A. 3400 Bayshore Rd. 8th. Alarm system, Naval air station. 9th. Myrtle & Lakeview Aves. 10th. Alarm system, 6th floor 9905 Seapointe Blvd. 17th. M.V.A., Car Vs. Pole. 782 Academy Rd. 17th. M.V.A., 223 Breakwater Rd. ** Elevator Rescue, 9901 Seapointe Blvd. 21st. Mutual Aide Sta.70 Tanker assignment Cedar Lake. 25th. Mutual aide Sta.60. Structure 24 Village Dr.
27th. Assist other Agency, Missing person search. 505 Mistletoe. 28th. Alarm system, 9701 Atlantic Ave.
29th. Alarm system, 9601 Atlantic Ave.
29th. AeroMedical Landing Zone assignment, Cape May County airport. 3rd. Alarm system, 501 Seashore Rd. 6th. M.V.A., 1025 Ocean Dr.
8th. M.V.A., 424 Breakwater Rd. 9th. Alarm system, 9904 Seapointe Blvd. 10th. Alarm pull station, 9904 Seapointe Blvd. 10th. Mutual aide Sta.60, Structure 1615 Garfield Ave.
12th. Mutual aide Sta.61, Structure 610 Jonathan Hoffman Rd. 13th. Elevator Rescue, 9601 Atlantic Ave.
19th. Transformer fire, Rt.109 & Tranquility Dr.
21st. Alarm system, 500 E.Raleigh Ave.
24th. Alarm system, 9601 Atlantic Ave.
25th. Truck fire, 650 Seashore Rd. 26th. Co Alarm / Smoke Alarm, 208 Dune Dr.
30th, Alarm system, 9904 Seapointe Blvd. 1st. M.V.A., 997 Ocean Dr.
2nd. Alarm system, 221 E.Madison Ave.
2nd. Transformers arcing, Tabernacle & Seashore Rd's. and Fishingcreek & Breakwater Rd's. 2nd. Branches on wires, Forrestal & Hornet Rd's. 2nd. Arcing wires, 377 Corson Ln. 2nd. Wires down, 611 Seashore Rd. 3rd. Pole down across roadway, 970 Ocean Dr.
3rd. Tree fell on propane tank, 784 Tabernacle Rd. 5th. Transformer fire, 723 Seashore Rd. 6th. Alarm system, 821 Seashore Rd. 10th. Mutual aide Sta.61, Structure 503 Rosehill Pkwy. 18th. Alarm system, 821 Seashore Rd. 19th. Gas leak, 900 Ocean Dr.
23rd. Fuel spill, 5100 Lake Dr. Dock "A"
31st. Gas leak, 1052 W.Rio Grande Blvd. 1st. Alarm system, 900 Ocean Dr.
2nd. Mutual aide Station 60, Structure 110 Charles St.
10th. Alarm system, 301 Rochester Ave.
11th. Alarm system, 994 Ocean Dr.
13th. Co Alarm, 9907 Seapointe Blvd. 19th. Mutual Aide Sta.61, Oven fire 304 Winslow Ave.
19th. Alarm system, 500 Raleigh Ave.
27th. Co Alarm, 762 Lillypond Dr.
30th. M.V.A., Hornet & Breakwater Rd's. 2nd. Special assignment assist other agency. 160 Briarwood Dr.
5th. Report of smoke. 3805 Bayshore Rd. 7th. Smell of gas. 157 Briarwood Dr.
10th. School bus smoking. Rt.47 at George Redding bridge. 12th. AeroMedical Landing Zone assignment. Cape May County Airport. 14th. M.V.A., Rt's 9 & 109. 15th. AeroMedical Landing Zone assignment. Cape May County Airport. 16th. Structure fire, 961 Tehcumseh Rd. 25th. Smoke alarm, 348 Willow Dr.
29th. Alarm system, 2 Mile Landing. 1025 Ocean Dr.
31st. AeroMedical Landing Zone assignment. Cape May County Airport. Does NOT include Drills, Individual training, seminares, classes, work details, special assignments, monthly meetings & apparatus maintenance.